If you feel moved to celebrate St David's Day* I've just posted a recipe from The Frugal Cook on my student site Beyond Baked Beans. On the basis that a) you're more likely to have the book than they are, b) they're more in need of a recipe than you are and c) if you haven't got it you can always click on the link! It's a nice one, actually. I made it this time last year with some scrag end of lamb but the meat came from an organically-reared lamb so the flavour was great. * Odd how we celebrate St David and St Patrick but don't get too excited about St George and St Andrew. Any idea why? He was arguing that people shouldn’t bother with recipes. I was saying - from personal experience - that they needed them when they were starting out. No-one cooked - as in cooked well - in my family so I had to teach myself from books, a habit I only broke when I became a more confident cook and learnt what ingredient went with what. There were many ingredients I used which I would have left out or substituted if they hadn’t been available. I had a fresh carrot, for example to use up so that went in. And some fresh parsley which gave it a bit of a hachis parmentier (the French version of shepherds’ pie) touch. I could obviously have substituted beef mince for lamb and passata for tinned tomatoes. But the red wine and cinnamon gave it its distinctive character. Here’s the recipe which I rather like. And so did my other half. Heat a frying pan, add 1 tbsp of the oil and fry half the lamb until lightly browned. Remove with a slotted spoon and drain off the excess fat/liquid. Without adding more oil repeat with the remaining meat. Put some fresh oil in the pan and fry the chopped onion and carrot over a low heat until soft. Add the crushed garlic, cook for a minute then stir in the oregano and cinnamon, then the tomato puree, tomatoes or passata and red wine. Season lightly with salt and pepper, bring up to boiling point then reduce the heat to low and leave to simmer while you boil the potatoes. Once the potatoes are cooked, drain them, cut them up roughly and mash them with a potato masher or fork. Add the yoghurt and olive oil, beat well then season to taste. Add a little extra stock, water or wine to the lamb filling if it has got a bit dry, stir in the parsley and check the seasoning. Preheat the grill* Transfer the meat to a shallow dish and top with the mash, spreading it evenly over the meat. Place under the grill until the top is nicely browned. Do you cook from recipes or do you tend to improvise? Or a bit of both? Do tell me how you learned to cook! Shrove Tuesday is one of the annual celebrations where the frugal cook really comes into his/her own for what could be more thrifty than a pancake? There are, of course, literally hundreds of recipes out there but here's a quick version of blinis* for you to try made with smoked mackerel rather than smoked salmon and caviar . . .
To make the pancakes mix the dry ingredients in a bowl, leaving a hollow in the centre. Separate the eggs and mix the yolks with the milk and 25g (1 oz) of the melted butter and gradually pour into the flour, stirring continually. Just before cooking beat the egg whites until sift and fold into the pancake mixture. Mix the sour cream with the yoghurt. Add 2 tbsp of the finely chopped onion, the dill and the salt and mix well. Heat a pancake pan or non stick frying pan over a medium heat, dip some scrunched up kitchen towel in the remaining butter and wipe it round the pan. Put 4 tablespoonfuls of the pancake mix in the pan then when bubbles begin to appear on the surface (about 45 seconds) flip them over with a palate knife and cook the other side. Place on a warm plate covered with a clean teatowel while you make the remaining pancakes, lightly greasing the pan between each batch. Serve each blini topped with a a dollop of dill-flavoured cream, a few flakes of smoked mackerel and a sprinkling of chopped onion. * Did you know that ‘bistro’ meant quick in Russian? Me neither. Even in the current rush to snap up cheaper cuts pigeon is good value. We bought two recently for £3.50 which have been sitting in the freezer for a few weeks so my other half decided to tackle them this weekend. He cooks like a typical bloke i.e. without the slightest concern for frugality. If I’m writing a a recipe I worry endlessly about the number of ingredients, in case readers don’t have them and feel they need to go out and buy them. He just plunders the storecupboard and drinks cupboard so this dish (basically pot roast pigeon in red wine) contained bacon, onions, mushrooms, rosemary, oregano, thyme, pimenton, chilli, cumin, mixed spice, red wine, brandy and grated dark chocolate. A sort of mole in other words and very, very good it was too. You could even cook it as he did then take all the meat off the bone and turn it into a luscious dark meaty pasta sauce along the lines of pappardelle alle lepre (pasta with hare sauce) only in this case it would be pappardelle alle piccione). Or into a Pigeon Pie. I just recommend cooking it well as it’s much easier to remove what meat there is off the bone. Do you cook pigeon or other game? If so how cheaply do you get it and what do you like to do with it? A night out with the girls yesterday: two friends - a chef and a fellow food writer who was researching a piece on budget eats in Bristol. We ended up in a takeaway with a couple of tables called Tiffins which I can see is going to be my new favourite place. We literally stuffed ourselves with cheese topped garlic-bread with chillies, one of the pizzas topped with Saag Paneer and Kheema (weird but good) and a couple of veggie curries and rice all served with quite the best fresh coriander chutney I've ever eaten (with chillies and coconut but I'm not sure what else). Jay says if I go back she'll tell me how to make it. We finished up with two heavenly little pots of homemade kulfi - one with mango, the other with pistachios and saffron so I'll try and see if I can find out the secret of those too. The bill for the 3 of us came to just over £20 which was pretty amazing and reminded me just what fantastic value and how delicious Indian veggie food is. Great inspiration for meals at home too. 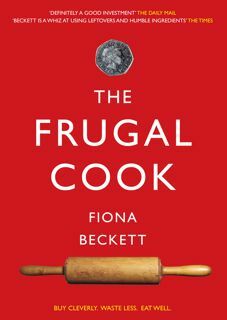 The Frugal Cook goes live! The demo which lasts from 6.30-8.30pm costs £35 including wine, beer and tapas. Great fun and learn how to trim your household budget into the bargain! 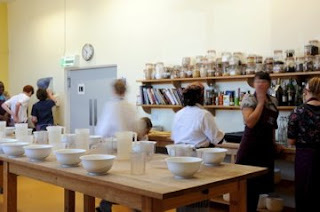 To book email cookery.school@bordeaux-quay.co.uk or call 0117 904 6679. Unfortunately this demo is now being postponed. Long complicated saga but good news if you wanted to come and couldn't make it. Well, back from holiday - er, my long working trip - and back to reality. The odd thing is that there doesn’t seem like there’s a credit crunch in Argentina. It’s sunny all the time for a start which always helps but it’s mainly that the Argentinians are so used to economic crisis they behave exactly as normal in any downturn. One woman I spoke to said that so many people had been stung in 1991 when the government devalued the peso (now 5 to the pound) and restricted access to their accounts that they are no longer prepared to entrust the banks with their savings. If they have money they spend it. Sound familiar? What else have I learnt (apart from how to judge a good Malbec)? That frugality is relative. Whatever you have in abundance and on your doorstep is cheap. In the Argentinians’ case that’s beef, corn and wonderful fruit and vegetables. I didn’t have to go there to find that out of course but it’s a lesson we tend to overlook. While I was away some of my students were posting on the Beyond Baked Beans page on Facebook that cucumbers had gone up to £1.20. (I checked and it was actually worse still - £1.28) Simple lesson - don’t buy cucumber at this time of year. It has to be imported and it’s pricey. Also it doesn’t excite people the way that more popular ingredients such as strawberries and tomatoes do so it’s never going to be discounted. If you live in the country there’s a chance that local food like game and locally grown vegetables will be relatively inexpensive. In town you’re more likely to pay less for herbs and spices. We’ve got so used to gratifying each and every culinary whim) that we decide what to make before we go shopping and actually see what’s cheap. It should be the other way round. Anyway enough of these jet-lagged ramblings. The urgent need is to shed the 3 kilos or so I must have put on while I’m away without making myself utterly miserable. Quitting the Malbec habit for a week or two will certainly help. Any other tips? The frugal cook is away . . . So communication may be a bit intermittent over the next week though those of you who are on Twitter might get an occasional tweet. 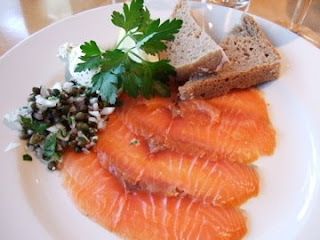 Let me share with you though what I had for lunch (what on Twitter is known as a lunchtweet). 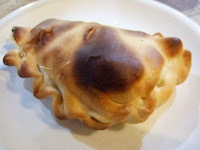 A couple of really tasty empanadas at 3 pesos each which came to a total of £1.20. For those of you who are unfamiliar with them they're a bit like a miniature Cornish pasty with different types of filling. I had a cheese and onion one (above) which seemed curiously British and a spicy meat one which is the most typical kind here. I did try to make them once but they're incredibly fiddly and it struck me as I was nibbling away that the spicy meat filling would make a great - and frugal - plate pie. Shall experiment once I get back. So long for the moment . . .
How can we stop wasting food? There's an excellent article in the Observer today by Alex Renton, highlighting how much food we still waste. He highlights salad vegetables as a particular culprit: Britain imports twice as much salad as it actually eats. The rest gets thrown away. I waste a great deal less food than I used to but I still throw food away. The odd blackened banana I meant to make into a smoothie or a batch of muffins. Some forgotten cheese that has found its way to the back of the fridge. Some leftover vegetables or gravy I couldn't bring myself to throw away at the time and which 3 days on are beginning to look a bit dubious. Salad - oh yes, salad and herbs that have deteriorated to a soggy mush and are unrescuable. Nothing to be proud of at all. While we can afford to replace the food we so wantonly waste there's no real incentive to be more careful but as anyone who is on a really tight budget will know throwing away food is simply throwing away money. A freezer certainly helps but more than anything I think it's a question of organisation and time management. Keeping the fridge and cupboards tidy so you actually know what you have. Setting aside a few minutes every day to plan what to do with anything that's in its last throes - and turning it into something tasty. Neither tidiness or time management are my strongest suit but I'm going to redouble my efforts. What about you? Do you find you waste much these days? Have you managed to cut back on the amount you throw away? What are the things you tend to chuck most often - is it salad? Do post your thoughts and your tips. PS on a lighter note the beginning of the article reveals that Michel Roux uses thickly cut potato peelings to make chips for his staff. Good tip - I definitely like the sound of that . . .
No let-up in the weather in the West Country today. I'm not sure my brain isn't iced up. Finding it incredibly hard to concentrate - and write in real sentences. Or maybe it's my new Twitter* habit. Tomorrow I'm actually going to venture out of the house provided we don't find another six centimetres of snow on our doorstep and go and buy some proper food. Since we got back from France on Wednesday (thank goodness. Ryanair cancelled our flight AGAIN today) we've been living off various permutations of bacon and eggs. Or that's what it feels like. I'm planning to make a a really good dish that the chef at my son Will's former pub The Marquess Tavern used to put on the menu and which we put in our beer and food book An Appetite for Ale. The top pie-like layer is made from slices of day (or two day) old bread which is dipped in the gravy created by the stew and baked until it's crisp. I could have waited until I'd made it before posting the recipe so that you had a pic to inspire you but thought you might want to try it this weekend. Heat 3 tbsp of the oil in a large frying pan over a moderate heat, add the onions and thyme and cook for about 10 minutes until soft, stirring occasionally. Remove the onions from the pan with a slotted spoon and transfer to a casserole. Trim any excess (but not all) fat off the lamb and cut into cubes and toss in the seasoned flour. Add a little more oil to the frying pan and fry the lamb in batches until brown, adding it to the onions as you finish. Deglaze the pan with 300ml of the stock and pour over the lamb and onions then add the ale. Bring to the boil, stir then simmer over a low heat for 1 1/2 hours. Add the carrots and more stock if needed then simmer for a further 30 minutes until the carrots are cooked. Season to taste with salt and pepper. Heat the oven to 225°C/425°F/Gas 7. Dip the bread slices in the gravy. Divide the remaining stew between individual pie dishes and top with a slice of the gravy-soaked bread. Bake the dishes in the oven until the bread is nicely browned and crunchy. (You could, of course, make this is a single dish, arranging the bread slices over the top). Any other good suggestions to keep out the cold? What have you all been cooking this week? Why go out on Valentine's night? Bonjour, bonjour and apologies for the lapse in communication over the last few days. As you may have guessed I've been over in France sorting out family affairs (complicated) and carousing with friends (light relief) and have now been marooned by the snow. No-one's going to feel especially sympathetic about that, I imagine, though it may make you feel better to know that it's been chucking it down and there's a serious threat that the nearby river may burst its banks. Global warming, eh? * You nearly always pay over the odds for a 'special menu' that's often not so special - and you don't get any choice. So - apart from the fact that you don't have to cook - why do it? My solution is to crack open a bottle of decent fizz and buy an indecent quantity of smoked salmon or cook something really simple like some big garlicky prawns or some scallops or a baked Camembert or even better, a Vacherin with steamed new potatoes and open a tub of really good vanilla ice-cream and serve it with a hot chocolate fondant pudding (not made by me). Not too much work, not too expensive, much more intimate. Or am I wrong? If you've booked a table for two tell me what's tempted you. Or what your planned menu is for the Big Night. Or will you ignore it totally and just bunker down with a cup of cocoa and a good movie? Tell us all.